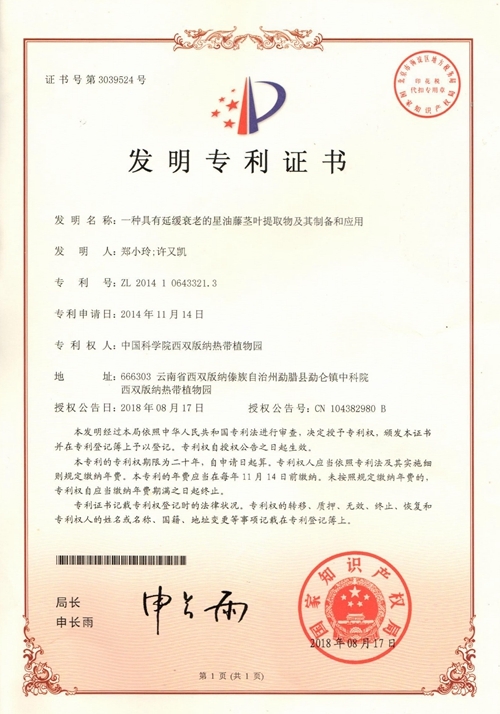 Prof. Xu Youkai and his student Zheng Xiaoling of Xishuangbanna Tropical Botanical Garden (XTBG) got a patent concerning Plukenetia volubilis leaf authorized. The patent numbers are CN104382980-A and CN104382980-B. The patent is named “Extraction of Plukenetia volubilis leaf, e.g. used for delaying senility function, by extracting leaf with organic solvent, filtering, concentrating, evaporating, adding water, purifying in chromatography column, concentrating, and drying”. The novelty of the patent lies in extraction of Plukenetia volubilis leaf comprises removing impurities from P. Volubilis leaf, drying, extracting with 1-100% of organic solvent for 1-10 times, combining extracts, filtering, decompression concentrating the filtrate, and evaporating to dryness to obtain crude oil; adding water to the crude oil to obtain an aqueous suspension, mixing with an organic solvent, extracting, and concentrating; and carrying purifying in a chromatography column, removing eluent, concentrating, and drying. Its method for the extraction of Plukenetia volubilis leaf can be used in health food or skin care anti-aging cosmetics for delaying senility function.